Julián Quillén Vidoz of the Museo de Historia Natural Noel Kempff Mercado uses a parabolic microphone to amplify the call of a distant bird. Photo by Greg Budney. 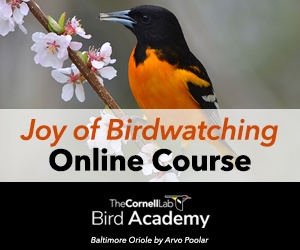 Making your own bird recordings can give you lasting mementos of wonderful birding experiences while providing valuable resources for scientists. And in the same way that binoculars and spotting scopes expand the reach of eyes, sound recording equipment expands the reach of ears, amplifying and homing in on hidden birds and distant sounds. Field trip leaders who hear a distant bird can hand over the headphones to participants and watch their faces light up as they pick up the sound loud and clear. You can teach yourself how to record bird sounds using the wealth of resources at the Macaulay Library website. For a hands-on experience under expert tutelage, the Macaulay Library also offers a week-long Sound Recording Workshop every summer where you can learn what noisy clothing to avoid; how to silently rotate your body to follow a moving sound without moving your feet; how to load your recordings onto a computer, edit them, and make them into CDs; and much more. If you want to borrow recording equipment to field-test it before buying your own, the workshop provides that opportunity as well. Learn more by visiting www.macaulaylibrary.org. You can record birds with a simple digital camera that has a video function, but the tiny microphones pick up much more noise than targeted sounds. The microphone in cell phones is most useful and sensitive for sounds produced within inches of the device. High quality sound equipment is as expensive as high quality optics, and can provide as much satisfaction. Whether you’re using sound equipment to make permanent recordings or simply want to extend your ability to hear distant birds, you’ll need a recorder to plug your microphone and headphones into. There are many kinds of recorders, including cassette and digital tape recorders, minidisks, mp3 players, some iPods, and solid state recorders. Some equipment becomes obsolete very quickly, so it’s a good idea before investing to ask for advice from other recordists. If you’re planning to offer your recordings for scientific use or want the highest quality for your own playback, it’s best to record on tape or save as uncompressed digital files (wav files). After saving the original file for archiving, you can edit and save digital sounds as mp3 files. Headphones connected to recording equipment help you hear exactly what sounds the microphone is picking up. People can’t help but filter out a great many ambient sounds, making birders miss a lot of animal sounds as well. Headphones emphasize every sound, making them much harder to filter out. Rob and John Cahill using a shotgun microphone. The fuzzy windscreen makes the sound clearer. Photo by Greg Budney. Studio microphones designed to pick up nearby voices don’t work well outdoors. Two types of microphones are directional enough for recording natural sounds at a distance: the shotgun microphone and the parabolic reflector microphone. Macaulay Library curator Greg Budney says the choice between them depends on what you’re trying to record. Parabolic microphones selectively amplify sound waves entering directly into the parabola and reflected into the microphone, while a shotgun microphone records all the sounds in the general direction it’s pointed without amplifying them. The parabolic microphone is a perfect tool for pulling one songbird voice out of the background sounds or from great distances, such as when the bird is in the canopy 200 feet above. A parabola can be ideal for recording wood warblers and other canopy species. When the parabola is properly pointed, the clarity of a single bird’s voice can be breathtaking, but it takes practice to get the sound accurately focused. Whenever the bird moves even slightly, the position of the parabola must follow it exactly. Laura Strickland using a shotgun microphone. Photo by Erick Greene. For more information about sound recording equipment, visit the Macaulay Library’s online review at http://macaulaylibrary.org/documents/AudioEquipment.pdf.